Not a beautiful dish, but a delicious one. Especially the accompanying broth. I) Extracts from Austrian writer Joseph Roth’s The Radetzky March in which Tafelspitz is eaten. II) Reflections on food and ritual. 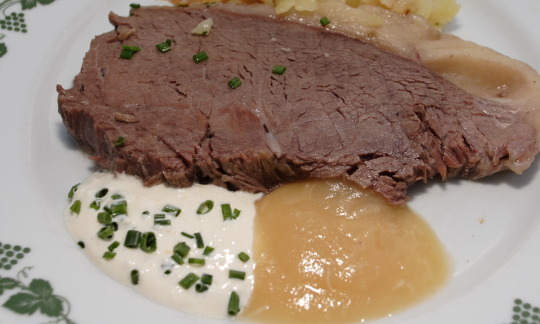 III) Recipe for Tafelspitz. This produced possibly best beef broth I have tasted. I was very nervous when I fed it to an audience of older Austrians at the Austrian Cultural Forum in London, but to my relief the gave it their enthusiastic seal of approval for flavour and authenticity. It was well known that Franz Josef I, emperor of the Austro-Hungarian Empire from 1848-1916, loved to eat boiled beef, or ‘Tafelspitz’. It was typically served with creamed spinach and roasted potatoes with various sauces in particular, horseradish and apple, and many in the empire adopted this meal as a sign of loyalty, along with the fashion for mutton chop whiskers. 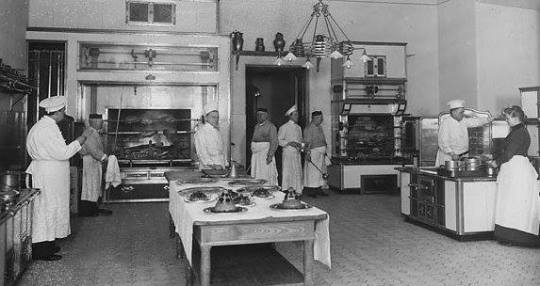 Boiled beef with the ‘all the trimmings’ followed by cherry dumplings features repeatedly in Joseph Roth’s novel The Radetzky March (1932). The slow decline of the Habsburg Empire can be observed in the changing approach to Tafelspitz three generations of the von Trotta family from the mid-nineteenth to early twentieth century. “Jacques disappeared and returned after a time wearing white gloves, which seemed to utterly transform him. They reflected a further snowy sheen over his pale face, his already white muttonchop whiskers, his white hair. Of all the things that passed for bright in this world, they were certainly the brightest. With these gloves he held a dark tray. On it was a steaming tureen. He set it down, carefully, silently, swiftly in the middle of the table. By custom, it was Fräulein Hirschwitz who served the soup, With amiably outstretched arms and a grateful smile in their eyes, they took the plates from her. She smiled back. A warm, golden gleam filled their bowls; the soup. Noodle soup. Clear broth with fine, yellow coiled noodles. Herr von Trotta and Sipolje ate fast, sometimes furiously. It was as though he were destroying one course after another, with noiseless, rapid, aristocratic aggression, finishing them off like enemies. Fräulein Hitschwitz ate tiny portions at table, and once the meal was finished enjoyed a complete second serving of everything up in her room. Carl Joseph hurriedly and timidly gulped down huge mouthfuls. That way, they all contrived to be finished at the same time. If Herr Trotta and Sipolje was silent, no one spoke. The soup was followed by boiled beef with trimmings, since time immemorial the old man’s preferred Sunday lunch. The admiring appraisal to which he subjected this dish took up more than half the meal. The District Commissioner’s eye first caressed the thin layer of fat that that edged the enormous piece of meat, then the various little side dishes on which the vegetables reposed, the violet luscious beets, the sober rich-green spinach, the bright, cheerful lettuce, the acrid white horseradish, the flawless ovals of new potatoes swimming in melted butter, somehow suggestive of little toys. He set about carving the meat, as he did every Sunday. He shot his cuffs, raised both hands in the air, and applying knife and fork to the joint, he turned to Fräulein Hirschwitz and observed: ‘You know my dear, it is not enough simply to ask a butcher for a tender piece. You need to see how it’s cut. Whether it’s cut along or across, I mean. Modern butchers no longer know their craft. They spoil the best meat by cutting it the wrong way. See here, my dear! It’s all I can do to rescue it. It’s frayed at the edges, it’s practically falling apart. As a whole it could probably be called ‘tender’, but the individual pieces will be tough as you will see in a moment. As for the condiments, as you would Germans say, I would like my horseradish a little dryer next time. It musn’t lose its edge in the milk. It must be produced afresh, not beforehand. This has been soaking a little too long. A mistake! ‘There was wine, and the beef and cherry dumplings were forthcoming as well…. ‘Fräulein Hirschwitz appeared in the grey silk she kept for Sundays. A strand of hair in her lofty coiffure now matched its grey. In spite of the short notice, she had managed to produce a Sunday lunch: noodle soup, boiled beef and cherry dumplings. How did Tafelspitz hold the Empire together in The Radetzky March? In the first long passage you see the operation of an empire at the dinner table on a small scale: multiple privately dissenting groups are brought together and compelled to enact certain behaviours by the repeated rituals of eating. Differences are forcibly assimilated. The narrative voice conveys the urgency around every small movement. With the identical facial hair and eating habits as the emperor, District Commissioner Herr von Trotta is a localised embodiment of the emperor and his table, an example of his rule – for empires, if they are to succeed, must be embodied. Everyone around the table forces their bodies to step in line with the eating rhythm of the District Commissioner, even if it means that they are not eating enough, or will get indigestion as a result of the way that they eat. As the countries in the empire dissent with the emergence of nationalist movements, it becomes weaker and likewise, the district commissioner grows frail, and his the strict ritual of the boiled beef breaks down. The beef is served late, or the pace of eating becomes in rhythm with individual desires, rather than in time with the District Commissioner. Finally, even he has lost his faith in the grandeur of the occasion and his intense verbal engagement with the ritual is reduced to silence in the final extract. “Eating, in fact, serves not only to maintain the biological machinery of the body, but to make concrete one of the specific modes of relation between a person and the world, thus forming one of the fundamental landmarks in space-time. 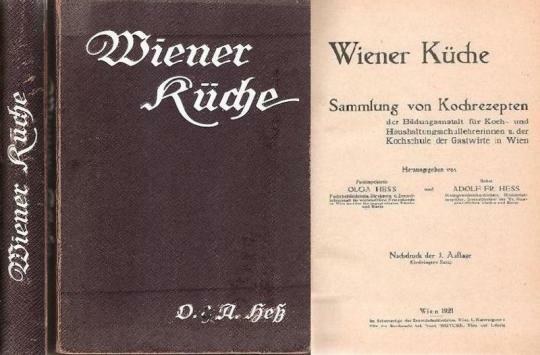 Olga Hess and her father Adolf Hess collected Viennese recipes towards the end of the Austro-Hungarian Empire: the defining tome Wiener Küche, which has since run into dozens of editions and been translated, just as the empire itself disappeared. Food can recall moments of pleasure from the past without necessarily recalling the accompanying violence and problems. Are we all golden-agists when it come to food? In some ways yes: food rituals do not have to be repressive, but they do play an important role in constituting our identity and sense of self, the intersection of our body, our memories and a sense of place in space and time. Scorch the cut side of the onion on a flame or in a hot pan and place in the large stockpot with the bones, carrots, leek, parsnip, celery, celeriac and dried mushrooms if you have them. Add enough water so all of the ingredients are well covered and bring to the boil. Boil for ten minutes, skimming the scum off the top constantly. Then, add the beef and add enough water so that it is covered. Bring to the boil and after 5 minutes of boiling, while skimming. Reduce heat and simmer for 1 hour, skim occasionally. Then add peppercorns, bayleaves and 1 tablespoon of salt, as well as the herbs. 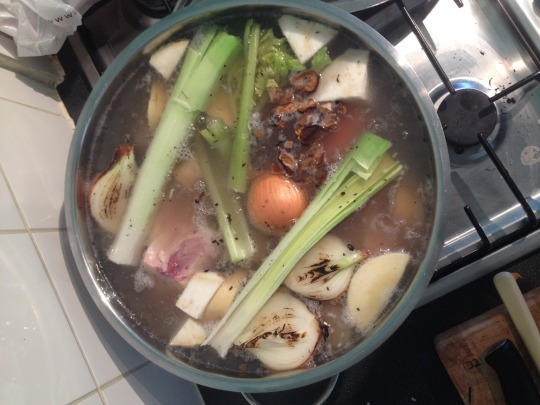 Simmer gently for 1 hour and 40 minutes, top up water if necessary – always keep the meat covered with water. Meanwhile, peel and core the apples for the sauce and cook with 3 tablespoons of sugar, until soft. Mix with the grated horseradish, season with salt and pepper, and add the vinegar to taste. For the sour cream sauce, simply mix together chives and cream. When the meat is tender, remove it from the pan and place on a warm plate and cover with foil. Strain the broth into a bowl through a clean tea towel or muslin place into a colander or sieve. Then return to the pan, emptied of the cooked vegetables. If you like, cook some fresh julienned vegetables in the broth to eat it with. Taste the broth for seasoning. Cut off the string and cut a ½ inch thick slice of hot beef with a splash of broth over it, a few grains of sea salt, and a spoon each of the two sauces. NB If eating this as part of a full meal, serve with roasted new potatoes and creamed spinach, and possibly a salad of beetroot.